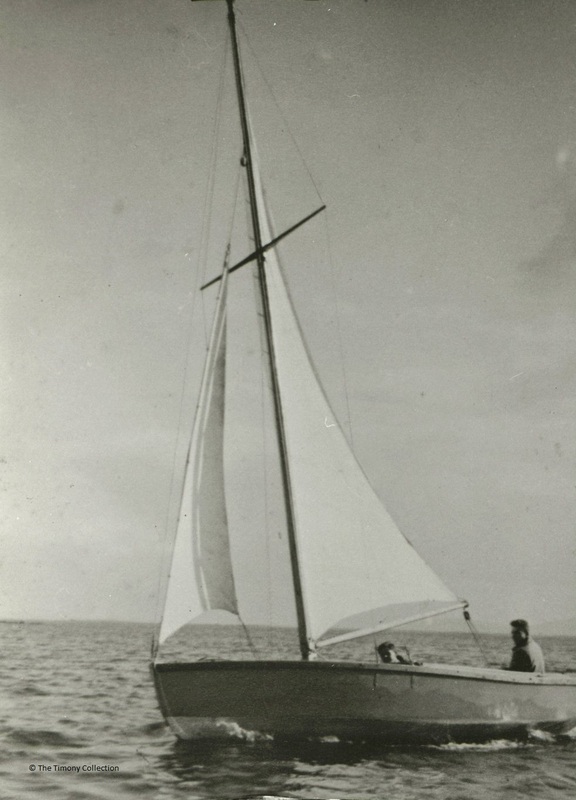 Reader enquiry: what design was this 18ft hard-chine day sailing boat from the 1940s? Reader Ronan Lee has got in touch to ask what the design of this boat in these photographs might be. Can anyone help? He has been told that that it was built in the 1940s from plans that might have come from a magazine or book, and that his father learnt to sail in her in around 1947-8. The boat’s builder has recently told Ronan that the boat his father learned to sail on was a Seagull 18 – though if so it’s clearly not the Bell Woodworking 18ft Seagull, which I think was a cabin boat and not a hard chine design like the vessel in the photographs. 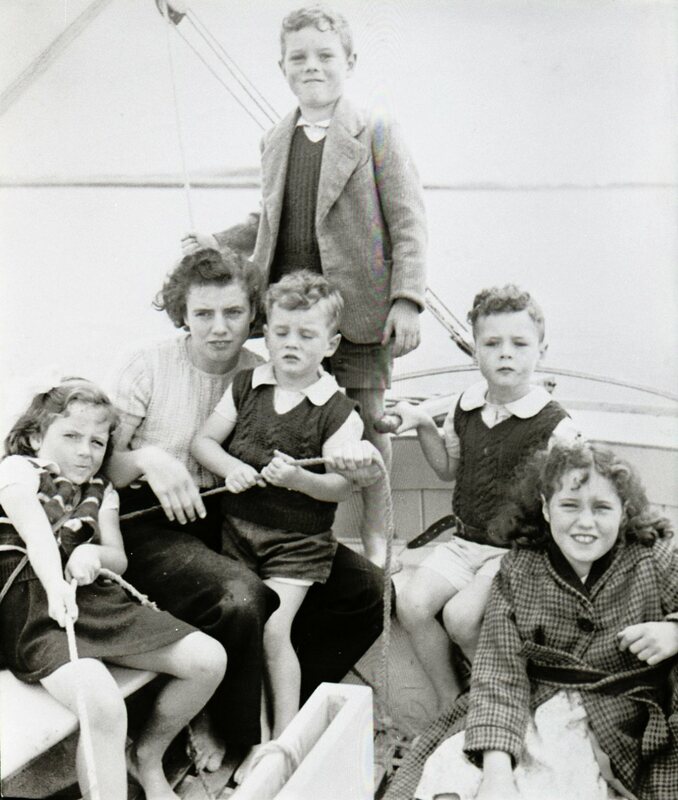 ‘The picture is one that I have been looking at in our old family album since my youth and has always inspired me as my father always spoke with great fondness of his time sailing in her. I wonder whether there might be two separate boats involved in these family stories? Mystery boats are always good fun! I’ve got one of Monk’s books… I’ll try to find it and take a look. You’re right that it does have that look, but it hadn’t crossed my mind that his designs had arrived here at that era. It could be a stretched version, or something else. The book also shows a picture (p.39) of a Hamble River Sharpie. Deck line and raised water stop look similar. Also main sheet arrangements aft. No kicker is in use, therefore rise of boom is common too. As is the shape of the transom. Does the programme suggest that there is a class of et least eight boats all of the same type? Im afraid not. 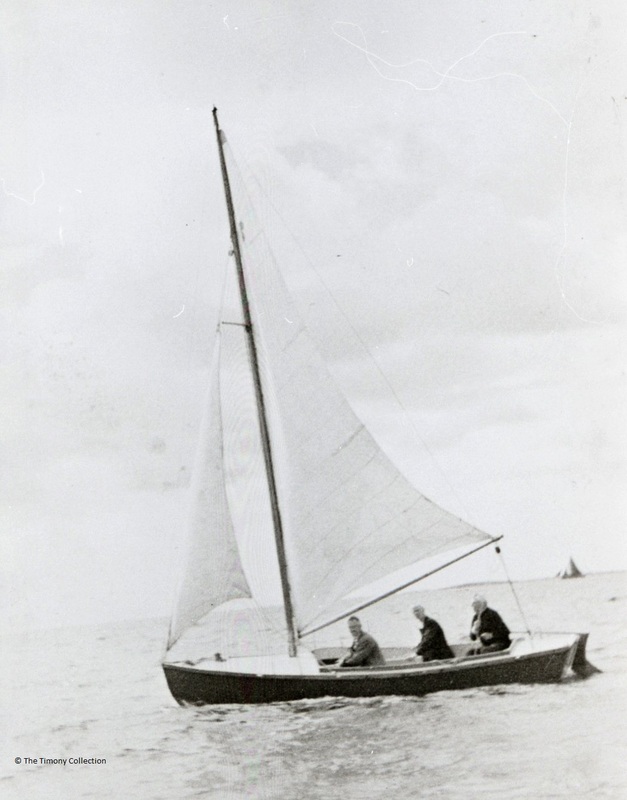 The race was held to give a boost to interest in boat building and sailing ,which had taken off in Galway as the war seemed to be coming to an end.The entire fleet consisted of 9 boats in total, which were divided into two races.Cruisers and Centreboards. Most boats were handycapped by time to level the field. “Sea Gull” were, although the only two boats racing that day that were identical, given different time handycaps. It seems levels of helm experience and boat performance were taken into account to give everyone a fair chance . Very different sportsmanship philosophy to where I do my racing ! I’ve got one of Edward Monk’s books of plans, but your father’s boat is not included. However, I’ve ordered another, which I’m hoping will include some better clues. I must say Monk’s 15-footer bears what could be a strong family resemblance. Well to me it lookslike a Snipe (http://www.snipe.org.uk/) they were not 18 feet but the photo looks very Snipe size as you will see in the attached link the Snipe Clss is just 80 years old which puts it in the right age bracket. If yoy Google snipe and open the images page with a line drawing which may norrow it down. We had one in Benfleet Yacht Club in the 60’s and 70’s. Edwin Monk, Bill Crosby (the Snipe designer), Edison I. Schock… all Americans who published how to build small boats books of plans, including “sharpie” types, before and after WW2. And their designs were regularly published in The Rudder magazine. Agreed. My father had a snipe class dinghy pon Lake Victoria in the 1940s. It was very like the one pictured. 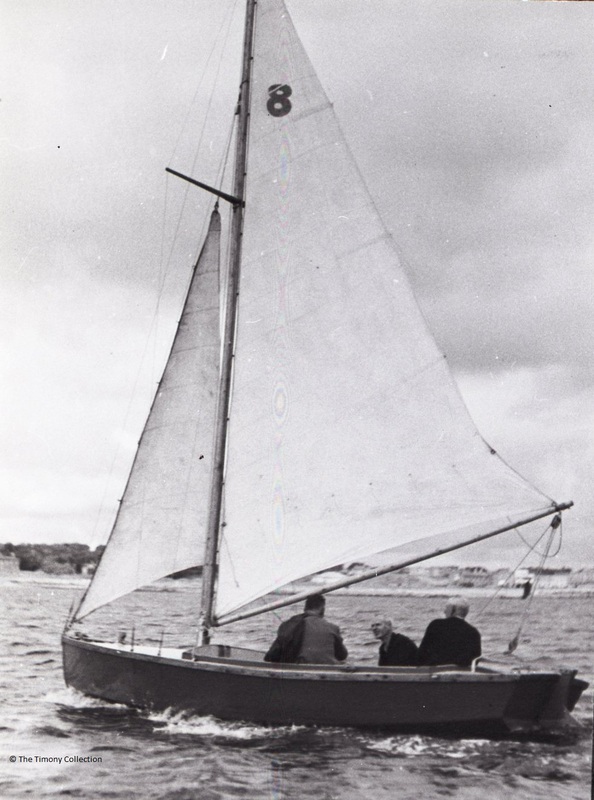 This link leads to some notes on the early days of Galway Bay Sailing Club in the mid-1940s, and mentions a sloop called Seagull. The photo is from much earlier, but perhaps not as early as the writer suggests. Aren’t the white clinker sloops of the Corrib Rowing and Sailing Club pretty… and doesn’t that straight stem cutter have some personality! He had it right the first time. I’m pretty sure that the boat is indeed the 18ft sloop “Sea Gull”, designed by William F. Crosby and first seen in Rudder magazine, the November 1930 issue. The plans became a standard offering in Rudder Magazine’s little catalog of boat plans, selling for $10.00 I built one in the late ’50’s in the hobby shop at RCAF Station Centralia, Ontario, Canada. The planking was 3/4-in cedar, the frames, transom, stem and keel were oak, and she was fastened with brass screws….all driven by hand. I finished the hull about the time my hitch was up, so regretfully had to sell it. But I was flattered that a local professional boatbuilder bought it for his personal use. (A catamaran builder near Grand Bend, Ont.) The Sea Gull design is archived with the Mystic Seaport Museum and copies can be purchased. Note that the many comments re the Snipe similarity are a reference to another Crosby design: the Snipe being his most popular. Bob Bridge, St. Peter’s NS, Canada. The boat appears to be a Yachting Monthly sharpie as we had a fleet of them at the Victoria Nyanza Sailing Club Uganda when I was there 1957-1963. They were originally built with a gaff rig but ere changed many years before I was there. There seems to have been a division of opinion on use of spreaders, but one boat does have the wide set seen on the Galway boat. Bob Bridge has it right. I am looking at the plans for the 18 foot Sea Gull. and it made for a stiffer boat for sailing in SF Bay. It was good in a strong breeze but slow in light airs. We nicknamed it the Rambler of sailboats. Sadly we sold it in the mid 70’s. I also owned a 1950’s Snipe and the similarities of the Crosby design of the bow, the hard chine and the transom were there. Wonderful. I like this slow, international process of discovery! 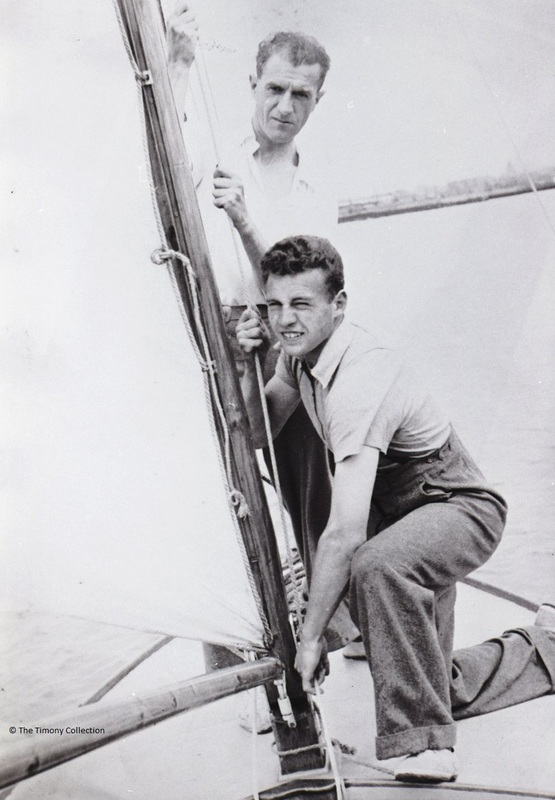 My father, George L. Geiger, at age 19, built a “Sea Gull” in 1931 in Venice, California. Named “Daisy R” after his mother, she had a small cabin and was rigged as a gaff-rigged yawl. She remained the family boat until 1967. We cruised hundreds of miles every year to Catalina Island and the Channel Islands off Santa Barbara. George has two coves named after him at Catalina: “Big Geiger” and “Little Geiger” coves.